Rupert Dullz isn’t very happy. His grandmother’s coffus is getting worse, school is boring and there’s nothing to do on his days off but rake up endless piles of leaves. Everything in Graysland is, well, gray, and every day is just like the one before it, and the one before that. That is, until a strangely dressed man named Pie O’Sky swoops out of nowhere in his multicolored bagoon and offers a special reward to whoever can open his mysterious door. When Rupert succeeds, he’s thrilled when Pie O’Sky carries him beyond it to the brilliantly colored land of Far-Myst. Adventure calls, and Rupert discovers a wonderful world full of something he’s never heard of before–imagination. 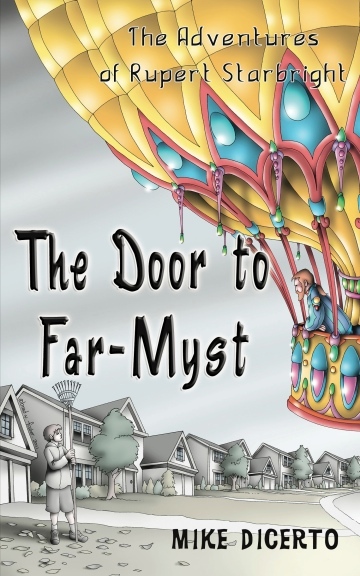 But Far-Myst is in danger, and it may be that only Rupert has the power to save it. Is he the one whose imagination is powerful enough to stop the evil that is destroying the beautiful world beyond the door? Purchase in trade paperback, and in ebook for Kindle and NOOK .